HOLY F#CK! Pass the cheetos. We already know that the Xbox 360 version of Dead Space 3 is going to utilize Kinect to allow voice commands in the game's co-op mode, giving you the ability to give ammo to your partner or various other support commands simply by speaking them. And while that's cool and all by allowing us to skip some cumbersome menus in co-op, it's the latest feature that has us just as excited. When we think of horror games we think of people screaming and swearing... will Kinect pick up on our feedback? So if you scream like a little girl at horror games you might be getting some bonus interaction. 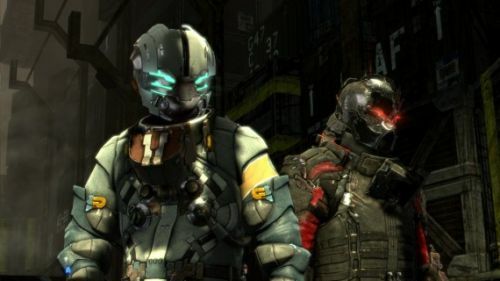 The co-op in Dead Space 3 will also see some other interesting scenarios arise, that is, above and beyond making fun of your partner for jumping and screaming at the three headed necromorph. Because dementia plays such a major part in the narrative, there are times that one player will be hallucinating while the other isn't seeing anything. Further, during these sections there are actual areas that open up in the game that wouldn't otherwise be accessible if only one player was present. I guess gone are the day when you used to press the space bar while running along the walls looking for a secret door - now you have to play co-op with a hallucinating psychopath. Dead Space 3 is set to be released on Xbox 360 (with optional voice support on Kinect), PlayStation 3 and PC on February 5th. All versions feature two player online co-op throughout the campaign. Page created in 0.4594 seconds.